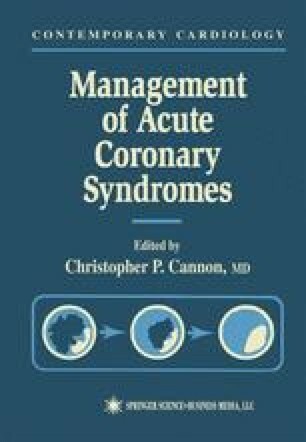 In over 90% of cases, a thrombotic occlusion of a coronary artery is the cause of an acute myocardial infarction (AMI) (1). Thrombolytic therapy has been shown to reduce short- and long-term mortality of AMI patients (2). As a result of several large placebo-controlled trials, thrombolysis has become a routine treatment in patients presenting within 6–12 h after symptom onset and with ST elevations or bundle branch block on electrocardiogram (ECG). The aim of the thrombolytic therapy is to achieve an early (within 30–90 min), complete (TIMI grade 3 flow), and sustained restoration of blood flow in the infarct-related artery. This “optimal reperfusion” is associated with a remarkably low in-hospital mortality of 3–4% (3, 4). The more rapid and complete the restoration of flow, the better the clinical outcome (Fig. 1). However, even with the most effective thrombolytic regimens available, rapid and complete perfusion can be achieved in only 50–60% of the patients (5, 6). Besides the initial failure of reperfusion, reocclusion after primarily successful thrombolysis (occuring in up to 15%) and bleeding complications (especially intracranial bleeding, observed in 0.5–1.0%) are the current problems of thrombolytic therapy. The ideal thrombolytic agent should be highly effective (high early and complete reperfusion rate), safe (low rate of hemorrhagic complications, e.g., intracranial bleeding), easy to administer (single-bolus application), and cheap. The most widely used agent worldwide, streptokinase, has limited efficacy with regard to early patency, has major side effects (including hypotension), and must be infused over at least 30 min (7). Recombinant tissue-type plasminogen activator (tPA; alteplase) achieves higher rates of early patency but necessitates a rather complicated dose regimen to achieve optimal efficacy (4, 8). Therefore the search for new thrombolytic regimens is still ongoing (9–11).